Several years ago I found out that cooking pigs feet in a pressure cooker is SUPER easy. The process is so easy that the pressure cooking is now my go to method for preparing delicious pigs feet. We all know the best benefit of cooking with the pressure cooker is the fact that you save time and best of all you can turn a really tough cut of meat into something very tender to eat. All that said you should give this method of cooking a try to see how things turn out for you. All so, below you'll find a few golden nuggets of information about cooking pigs feet in a pressure cooker that was submitted by a few loyal fans of this website. Read over the material and learn a thing our two. I sure did and maybe you will too. The most often question asked is how long does it take to cook pigs feet in a pressure cooker? The best answer is it'll take a lot less time than boiling pigs feet the tradition way. Now here is some great information for you. There are very few hard rules when it comes to cooking. Recipes are meant to be a guideline, unless one is baking. Pressure cooker times vary with amount of pressure used and water amount. Not all pressure cookers are alike as some will handle varied pressures safely while some require staying with lower heat settings for safety. Some people like their trotter chewy, some like them to fall apart. While many people like to have their trotters split or cut up before cooking, I do not. I feel that there are enough small bones to deal without cutting them up. I cook them whole, that's just my preference, and I know it requires that I cook them a little longer. My pressure cooker pressure cannot be adjusted, so the manufacturer requires keeping pressure at lower range by keeping heat at low medium. Whole feet take an hour for me, sometimes a few minutes more as I like them to fall apart, and yes, for the calcium I do like to chew up the bones that are soft enough. Have you ever made an all day bone stock? At 45 minutes the bones won't pull apart in my cooker. The core of the trotters remain en mass. So, I suggest experimenting and see what works for you, starting with maybe 30 minutes. If they are not done, simply put the lid back on and go for another 10 and check. If 30 minutes is too much, it certainly won't be enough to be problematic. Just try 10 minutes less next time and see how that works for you. 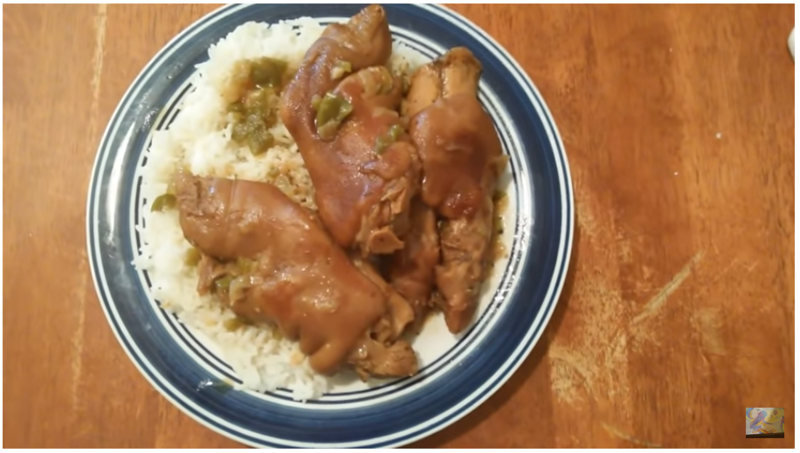 I'm glad that I have used my pressure cooker for many many recipes over the years, and I know that there is no way pig feet will take 45 mins in a pressure cooker. I used 2 cups water, 3/4 cup white vinegar, two bay leaves balanced atop each of three split pig feet, pepper corns resting on areas not covered by bay leaves. Secured lid. Placed rocker on vent. Brought cooker to steam. Adjusted heat to keep rocker moving gently, evenly. DONE in 20 minutes. Meat and bone were separated. Allowed cooker contents to cool before handling. Lifted meat into heated jar. Strained liquid. Poured off fat. Poured liquid over meat in jar. Topped off with white vinegar so that all meat was submerged in liquid. Capped. Placed in frig until gelatin was firm. And ENJOYED! In 25 more minutes (or 45 mins total as instructed by "Soul food and Southern Cooking") the bones would have been mush and I could have eaten those, too. Well, maybe that was the idea all along. But thanks, I'll return the bones to the earth, and swoon for the delicious pickled meat. Mmmmmm! You don't have to drown them. Put four to five split feet in 2 cups of water, 1/2 c. vinegar, 1/2 teaspoon crushed red pepper (to taste), 2 to 3 stalks celery, and 1 small onion. Put top on and after it rocks cook 45 minutes to an hour. I checked after 45 minutes and gave it another 15 minutes for falling off the bone and really tender skin. I just bought myself a new pressure cooker. The first meal I cooked was a pot of beans. Surprisingly it only took me 12-15 minutes. I should have adopted the practice of using a pressure cooker many years ago. Had I done so, I could have saved myself thousands of hours away from the kitchen. In any case, my next adventure is trying to pressure cook pigs feet and then I'll try my luck with some chitterlings. I'll let you know how things turn out. It takes approximately 45 minutes to cook some tender and juicy pigs feet in a standard pressure cooker.